Today we had whales to the north and whales to the south - never a bad situation! This morning while hiking off the sound end of the island I saw a group of active whales offshore, but this afternoon we decided to head north on the Western Prince to meet up with some whales coming down from the Fraser River. 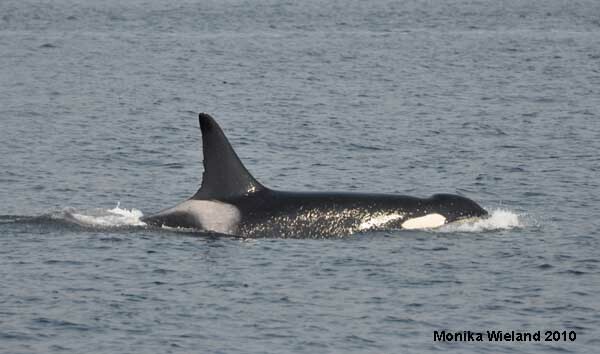 The first group of orcas we came upon were the J17s. J17 Princess Angeline was with her one year-old J44, and one of her other daughters J35 Talequah was there with her young calf J47. Here is J47 launching out of the water. When you're little you have to get that head high out of the water on every breath! 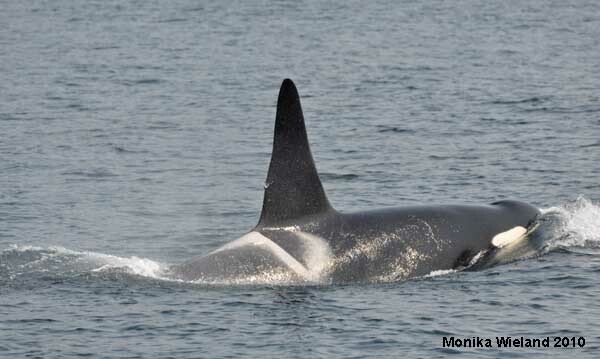 Inshore were the J11s and J22s, but offshore towards us the next whale that came along was the adult male K21 Cappuccino. I mentioned in a post last week about his new wound on the back of his dorsal fin. Today I was able to get a better photo and crop it in to take a closer look. It looks painful! I wonder how he got it? As expected, Cappuccino's sister K40 Raggedy wasn't too far away. 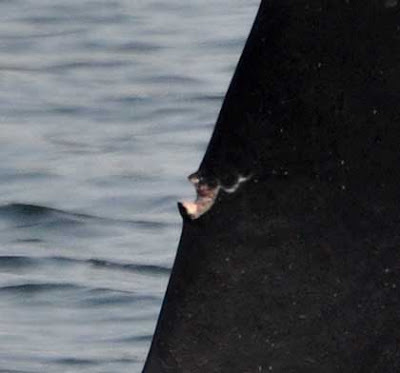 She got her name for the ragged trailing edge of her dorsal fin. She's an interesting whale, because she's a 47 year-old female that has never been seen with a calf. Is she infertile, have her calves never survived long enough for us to see them, or perhaps has she chosen to never have offspring? We don't know. Cappuccino and Raggedy are a couple of special whales to me because they are the first whales I ever saw up close when I first came to the San Juan Islands ten years ago. 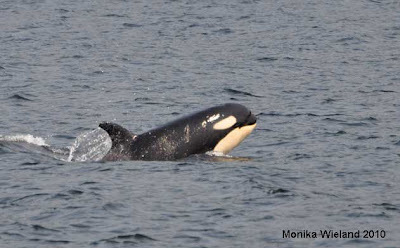 Back then their mom K18 Kiska was still alive, and the three of them made quite an impression on me - enough of one that I've come back here every summer since then! I was just listening to the hydrophones at orcasound.net and heard quite a lot of vocalizing. It sounded to me like the two groups of whales from this morning had probably met up and were enjoying socializing with one another! Hopefully all the great sightings will continue, as August has started off just as great in terms of whale encounters as was the entire month of July.